Start a new chapter at Ever After High, where the teenage sons and daughters of famous fairytales decide whether or not to follow in their parents’ fabled footsteps or discover their own Happily Ever Afters. Their epic explorations and escapades take them to Mirror Beach, a wicked cool place for fun in the sun and by the water. Dressed for a day of legendary fun, this posable Madeline Hatter, daughter of Wonderland’s Mad Hatter, doll is crazy cool in a shiny blue and purple suit paired with a sheer purple cover-up with golden print and black ruffle. Blue sandals, a ruffled golden necklace and blue teapot-inspired sunglasses are tea-riffic. 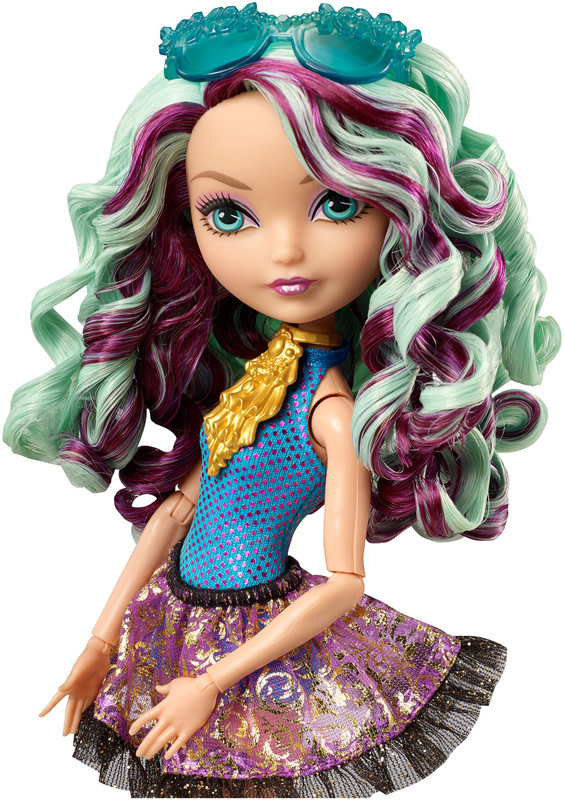 Collect all of the Ever After High Mirror Beach dolls (each sold separately) to expand the hexquisite display and storytelling fun. Doll cannot stand alone. Colors and decorations may vary. Ages 6 and older. Dressed for a day of legendary fun at Mirror Beach, this posable Madeline Hatter doll looks hexquisite in a shiny blue and purple suit paired with a sheer purple skirt with golden print and black ruffle. Blue sandals and a ruffled golden necklace are enchanting. Blue teapot-inspired sunglasses complete the spelltacular look.